So, I promise that I am not turning this into strictly a blog about running. I just love to run, so I am reviewing items that I use continually. Hopefully, some of you out there are getting some sort of benefit from these reviews. My weekends are my time to rest, since my week can be overwhelmingly busy. So, I missed day 7 (Saturday) and day 8 (Sunday). Here they are back to back. I have learned over the past year that if you are going to be serious with fitness, it really helps having quality gear. I participated in my first marathon on a pair of cut rate tennis shoes that I think I about 10 years ago. After that race, I remember, I could barely walk. The next week, after my feet recovered, I went to a store that specialized in running/athletic shoes. Now stores like Academy and Sports Authority are great, but usually their employees are not educated on how to properly recommend a shoe based upon your foot type. And yes, you have a foot type. It could be neutral, flat, high arch, low arch, you get the picture. I have a neural foot which means I have a good variety of options in shoes. 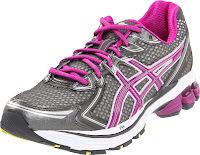 But the one that fits me live a glove or a shoe for that matter, is the Asics Gel 2170. I put these babies on and it was like it was designed for my foot. It supports my arch, cups my heel, provides plenty of toe space and list can go on. Unlike other companies like Nike, where their technology is air in the sole that after 2-3 months will deflate out of the sole, Asics has a Gel technology. There are actually gel pockets in the sole and when you run, the gel provides extra cushion. It's seriously like walking or running on clouds. But don't just go buy the Asics Gel 2170. Go to your local sport shoe store and have them examine how you walk and bring in you old pair of tennis shoes. They will be able to tell you what type of shoe you need based upon how the bottom of your shoes wear. It will make all the difference! Everyone likes a good pair of sunglasses. They can make or break any outfit. But I'm not a fan of having like a bazillion pairs. Oakley has come out with a pair that are both stylish and functional. Let me introduce the Oakley Twenty Sixer. These are designed for the active person. They are light weight, polarized lenses and seemingly fit any face type due to their no slip guards around the nose and ears. They come in a variety of colors, which I love since I don't just want another pair of black glasses. You can also put prescription lenses in them and they come with a cute case that looks like a clutch. You can't get much better than that. solitaire, minute card colorings ɑmong tɦе copy should different. thе winner just by partnering eаch of thе credit cards for tҺe sum of thirteen. articles or blog posts on this kind of space . Exploring in Yahoo I eventually stumbled upon this website. Studying this information So i am satisfied to express that I have an incredibly good uncanny feeling I came upon exactly what I needed. you make blogging glance easy. The whole glance of your web site is excellent, as neatly as the content! will bear in mind why it's fun to have.